“Yer tearin’ me apaaaart!” If you thought that agonized line originated with THE ROOM you are a sad, sad character. Go back to writing GUARDIANS OF THE GALAXY fan fiction in crayon and trying to sell the studios on a TWILIGHT/HUNGER GAMES crossover (sad thing is, you’ll probably succeed and go on to a much better life than I ever had). The statement originally came from screenplay of the 1955 immortal REBEL WITHOUT A CAUSE. Yes, it’s a bit dated by modern gangsta-rap and sext-message tastes. But for a generation of viewers it’s still the troubled-youth drama to which all troubled-youth dramas must measure. Plus, I’m told, fans of classic American automobiles get multiple cargasms from viewing. Teenage lawlessness and hoodlums had been depicted in Hollywood movies before, but always in an urban-slum environment (think "Bowery Boys"). 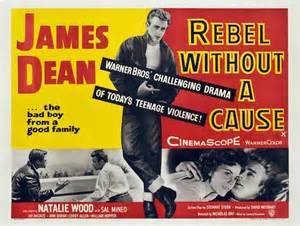 Daring for its era, REBEL WITHOUT A CAUSE showed 1950s auds that nice middle-class suburban kids could go wrong too. High schooler Jim Stark (James Dean, who practically owns the camera) is perpetually moody and in trouble, despite - maybe because of - his doting but conflict-timid father (Jim Backus, usually always seen as a comedian in movies and TV, is here interestingly cast in a dramatic role). Starting at a new school after unspecified problems elsewhere, Jim befriends a sensitive misfit boy (Sal Mineo) from a broken home, and he also catches the attention of popular classmate Judy (Natalie Wood) with her own baggage of family turmoil. Judy is part of a gang-like clique that bullies Jim and goads him into a dangerous drag-race duel (in stolen cars) that results in tragedy. Despite outdated touches - these punks don't listen to rock music, but rather big-band swing – REBEL WITHOUT A CAUSE still comes on strong; from the opening scene of live-wire actor James Dean drunk in the gutter, there a sense that the film means business. It was indeed an iconic screen drama of the 1950s, serious-minded, superbly acted and designed to illuminate the hot topic of juvenile delinquency - which authorities at the time blamed on everything from Bill Haley's Comets to comic books. Here, although no quick fixes are offered, the diagnosis is grounded in Freudian psychology. It's hormones and parents, in Jim's case his ineffectual dad and domineering mom, in Judy's case a father distanced by the girl's maturing sexuality. Suggestions of closeted homosexuality on the part of Mineo’s character (Johnnie, AKA “Plato”) didn’t survive the picture’s gestation and studio censorship (onscreen the character’s infantilism is ascribed to being the son of a distant, divorced single mom), but it’s not hard to read it between the lines. The gang violence and youthful recklessness that drives the plot is shown to be petty and futile. Even Buzz, Jim's hood-like enemy, says he likes Jim, but fights with him just for appearance's sake, or maybe a heavy sense of existential boredom ("Gotta do something"). Supposedly the scenario resulted from filmmaker Nicholas Ray researching hundreds of police reports with the actors and concluding that out-of-control teens, even in apparently "good" families, get a raw deal from moms and dads unable to understand and cope with them.